Schlichting earned her undergraduate degree at Cambridge University in England and her doctorate from Caltech where she was advised by Re'em Sari and has recently been completing a postdoctoral fellowship at UCLA. 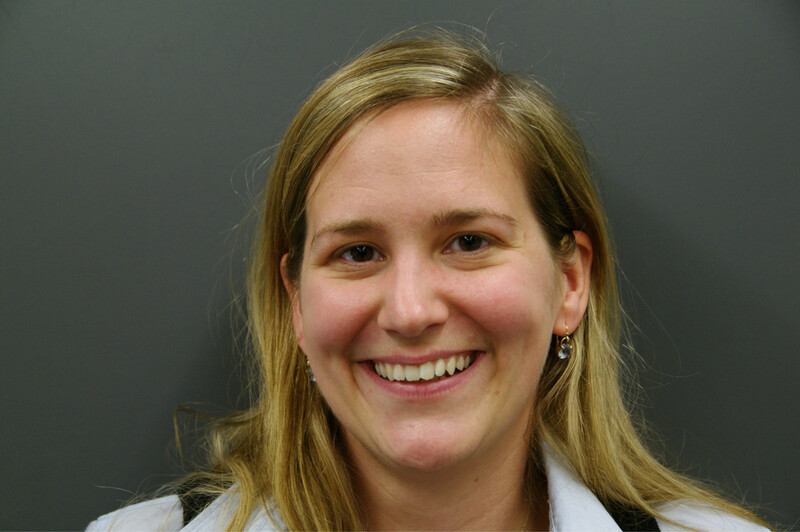 She joins the EAPS faculty as an Assistant Professor of planetary science. Hilke's email is hilke [at] mit [dot] edu. After receiving his bachelor degree in geology from the Universidad Nacional de Colombia, Prieto obtained his doctorate in earth sciences from Scripps (UC San Diego). 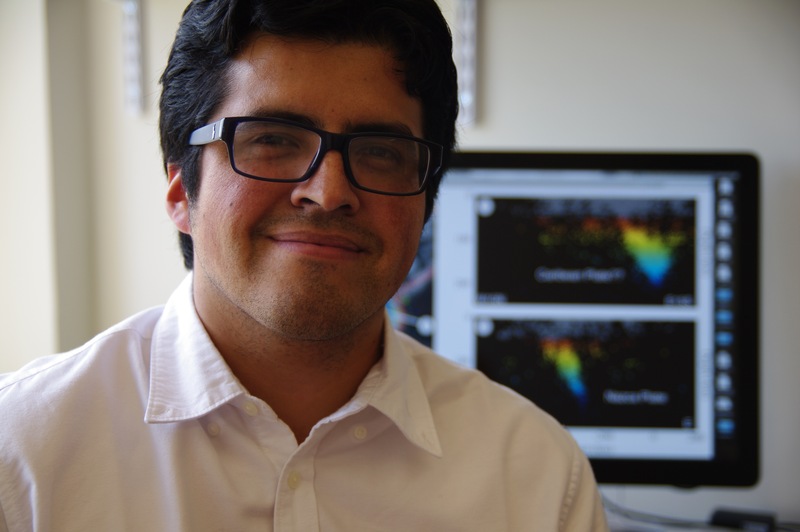 Since 2009 Prieto has been an assistant professor in the physics department at the Universidad de los Andes. He joins EAPS as an Assistant Professor of geophysics. Germán's email is gprieto [at] mit [dot] edu. 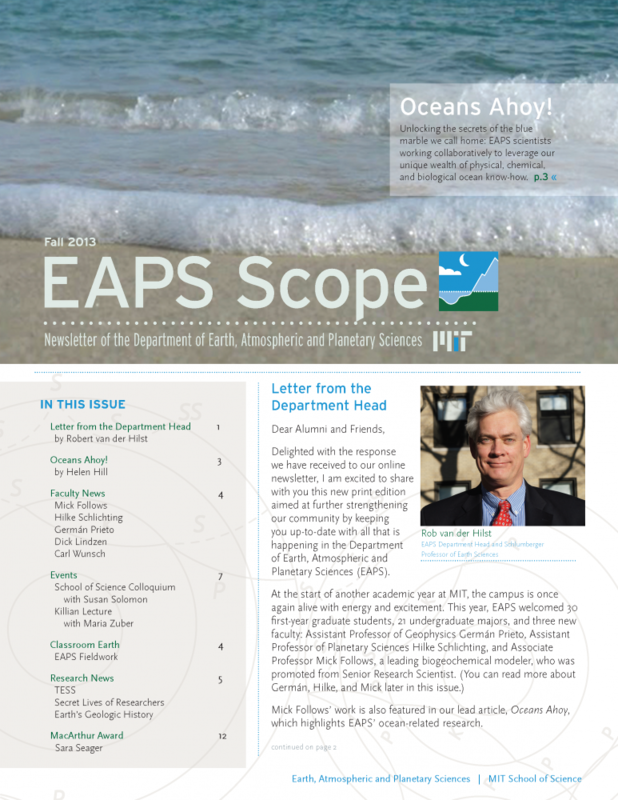 In February EAPS was delighted to announce that Mick Follows, recent recipient of a Gordon and Betty Moore Foundation marine microbial ecology award, and current Senior Research Scientist, had been appointed as Associate Professor (with tenure) effective July 1, 2013. Mick Follows, who has been at MIT since 1992, seeks to understand how the interactions of physical, chemical, and biological processes modulate the structure and function of marine microbial communities and regulate the oceanic cycles of carbon and nutrient elements on global and climate scales. 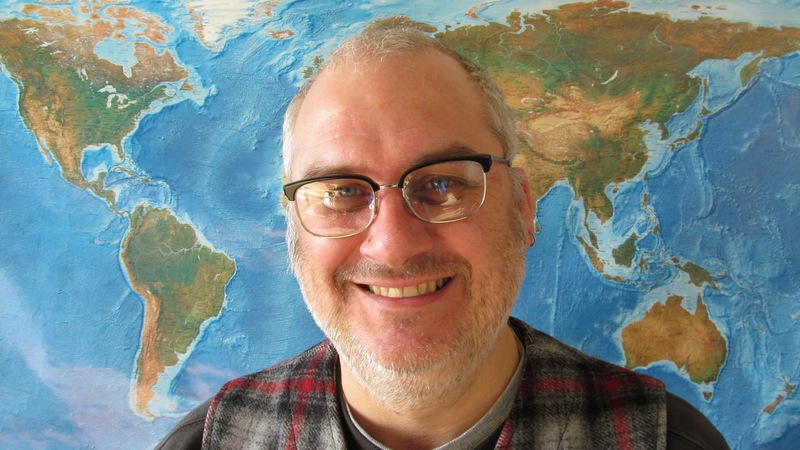 Using idealized theory, numerical models, and the analysis of observed data, he and his group seek to identify the relationships of individuals and communities to their environment, connecting cellular-scale processes to global microbial community structure. In particular, the Darwin Project team he leads has created a powerfully instructive unique marine ecosystem model that, when initialized with many phytoplankton types whose physiological traits have been determined stochastically, results in emergent community structure and biogeography consistent with known distributions of microbes in the global oceans. Long time professor of Meteorology, Richard Lindzen, retires. Atmospheric physicist and former Alfred P. Sloan Professor of Meteorology Richard Lindzen is known for his work in the dynamics of the middle atmosphere, atmospheric tides, and ozone photochemistry. During a career spanning over 30 years, he has published more than 200 scientific papers and books and was a lead author of Chapter 7, 'Physical Climate Processes and Feedbacks,' of the IPCC Third Assessment Report on climate change. Lindzen was educated at Harvard (SM, '61, AB, '60) completing a PhD in 1965 Radiative and photochemical processes in strato- and mesospheric dynamics advised by R.M. Goody. He moved to MIT in 1983, having held positions at the University of Washington (1964–1965), Institute for Theoretical Meteorology, University of Oslo (1965–1966), National Center for Atmospheric Research (NCAR) (1966–1967), University of Chicago (1968–1972) and Harvard University (1972–1983). He also briefly held a position as Visiting Lecturer at UCLA in 1967. He is the author of a standard textbook on atmospheric dynamics Dynamics of Atmospheric Physics, and co-author of the monograph Atmospheric Tides. Among his EAPS students are Daniel Kirk-Davidoff (PhD MIT 1991), now Assistant Professor at the University of Maryland, and Gerard Roe (PhD MIT 1999) currently Adjunct Associate Professor at the University of Washington. 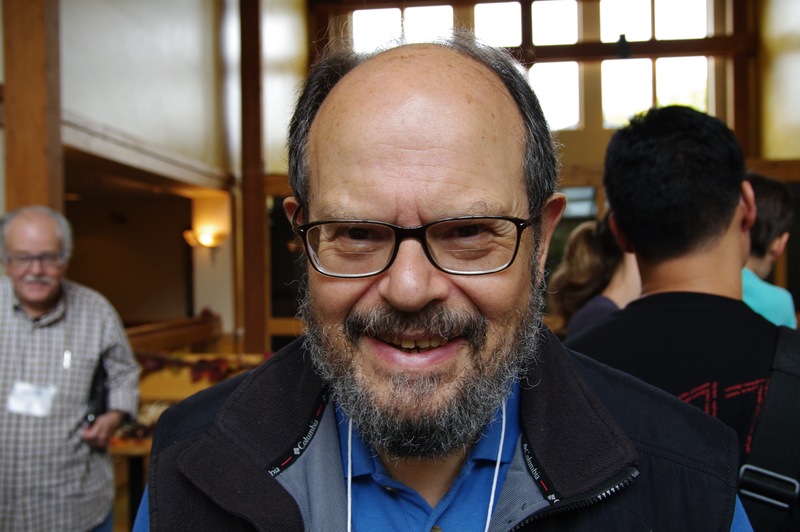 Lindzen received the AGU's Macelwane Medal, and the AMS's Charney Award. He is a member of the National Academy of Sciences. Effective January 1, 2013, Carl Wunsch, Cecil and Ida Green Professor of Physical Oceanography at MIT, officially retired. 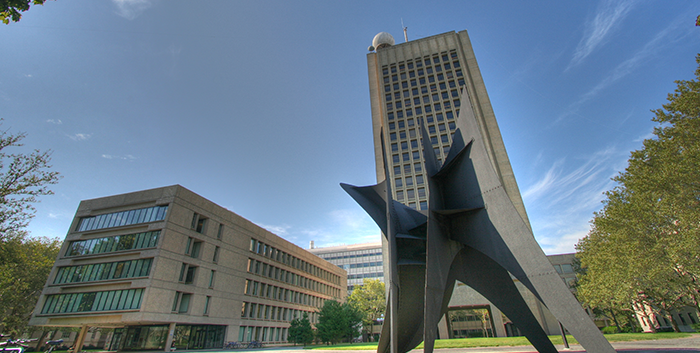 Carl Wunsch is an MIT-lifer. With an SB in mathematics (1962) and a PhD in geophysics (1966) advised by Henry Stommel, followed by an entire professional career at MIT (though interspersed with two year-long sabbaticals at Cambridge (Department of Applied Mathematics and Theoretical Physics) and others at University College London, the Oceanography Centre in Southampton, GRGS-Toulouse, and Harvard University. He was the George Eastman Visiting Professor at Oxford University for the academic year 2011-2012. Wunsch has worked on many aspects of physical oceanography and its climate implications, with emphasis on observations of all types, including the global-scale, using satellites and acoustic tomographic, and various conventional observation methods. Early in his career, he spent many months working at sea. He was an organizer of the World Ocean Circulation Experiment, chaired the science committees leading to the flight of altimetric satellites, and is deeply involved in the analysis of the oceanic general circulation and its climate influences including aspects such as sea level change, and the interpretation of the paleoceanographic record. His interests exploit mathematical methods such as inverse theory and state estimation for understanding of the ocean circulation and climate. He is a member of the National Academy of Sciences (1978), a Foreign Member of the Royal Society of London (2002), a Fellow of the American Academy of Arts and Sciences (1979), American Philosophical Society (2003), American Geophysical Union, and American Meteorological Society and has received a number of awards including the Bowie Medal of the American Geophysical Union (2006), and the Prince Albert 1st Medal (2007). 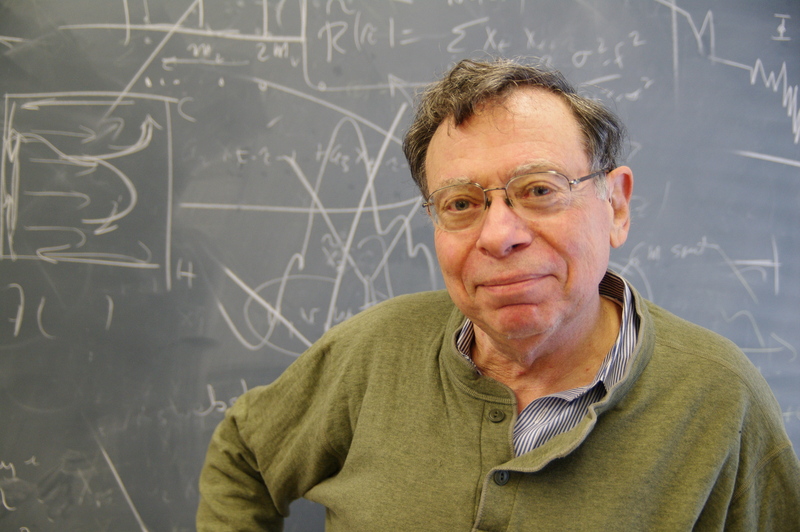 Wunsch is the author or co-author of about 250 scientific papers and the author of several books including, Ocean Acoustic Tomography (with W. Munk and P. Worcester); The Ocean Circulation Inverse Problem; and Discrete Inverse and State Estimation Problems, all with Cambridge. Former students include Nelson Hogg (PhD MIT 1971) now Scientist Emeritus at the Woods Hole Oceanographic Institution, Dean Roemmich (PhD MIT 1979) now a professor at Scripps Institution of Oceanography, Lee-leung Fu (PhD MIT 1980) now a project scientist at NASA, JPL, and Eli Tziperman, now the Pamela and Vasco McCoy, Jr. Professor of Oceanography and Applied Physics at Harvard to name but a few. Despite the adjustment in his title, Wunsch divides his time between MIT and Harvard, and continues to publish prolifically. A check of Google scholar since 2012 yields papers in Journal of Climate (2), Journal of Physical Oceanography, Proc. Nat. Acad. Sci., and Deep Sea Research. Carl celebrates his 72nd birthday this year. Robert R. Shrock Professor of Geology Samuel A. Bowring was elected to the American Academy of Arts and Sciences | Senior Research Scientist William Durham was elected to the German National Academy of Sciences Leopolina | Cecil and Ida Green Professor of Atmospheric Science Kerry Emanuel was awarded Deerfield Academy’s Heritage Award | Associate Professor Michael Follows was elected a Fellow of the American Academy of Microbiologists | Cecil and Ida Green Professor of Geology Timothy Grove was elected an Honorary Fellow of the Geochemical Society and the European Association of Geochemistry | Cecil and Ida Green Professor of Earth Sciences and Director of ERL Brad Hager was awarded the AGU’s Lehman Medal | Principal Research Scientist Robert King is the inaugural recipient of the AGU’s new Ivan I. Mueller Award | Cecil and Ida Green Professor of Oceanography John Marshall was awarded the AMS’s 2014 Sverdrup Medal | Professor of Meteorology R. Alan Plumb was awarded the Jule G. Charney Award of the American Meteorological Society | Professor of Geology and Geophysics Leigh Royden received the 2013 Stephan Mueller Medal of the European Geophysical Union | Class of ‘41 Professor Sara Seager (Chair of the Program in Planetary Science) was awarded a MacArthur Fellowship. She was previously named one of the “25 Most Influential People in Space” by Time Magazine | Esther and Harold E. Edgerton Career Development Assistant Professor, atmospheric chemist Noelle Eckley Selin was awarded a Leopold Leadership Fellowship | Ellen Swallow Richards Professor of Atmospheric Chemistry and Climate Science Susan Solomon won the 2012 Vetlesen Prize and was elected Honory Fellow of the American Meteorological Society | Professor Emeritus John Southard was awarded the Twenhofel Medal from the Society of Sedimentary Geology (SEPM) | Professor of Geophysics Daniel H. Rothman was elected to the American Physical Society | Professor Emeritus Carl Wunsch was elected an Honorary Fellow of the Royal Meteorological Society.